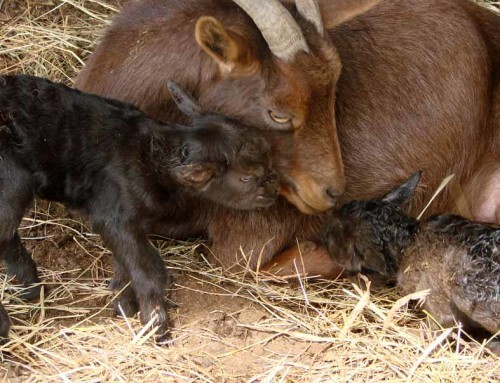 I think this is my favorite picture from 2007, with our goat nosing a tiny baby bunny. I also went to Alaska that year with my dad, and had a lot of nice pictures from there, but I’m going to stick to farm pics here. It’s really hard choosing just one picture from each year! Here are a few from 2008. 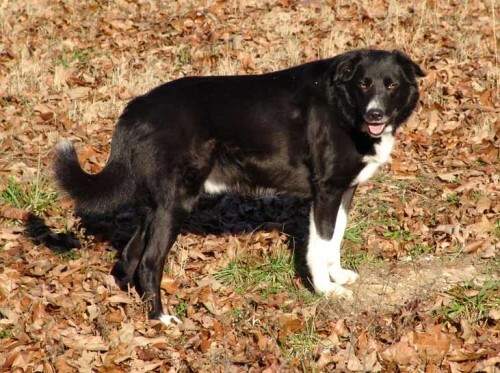 The first is of Toby, our precious farm collie that I still miss bunches! Did I mention choosing just a few pictures from each year is hard? Wow! I love taking pictures, so when I was more active on this site, there were lots and lots of photos! I keep a framed 5×7 of that one in my office! They loved getting up high! 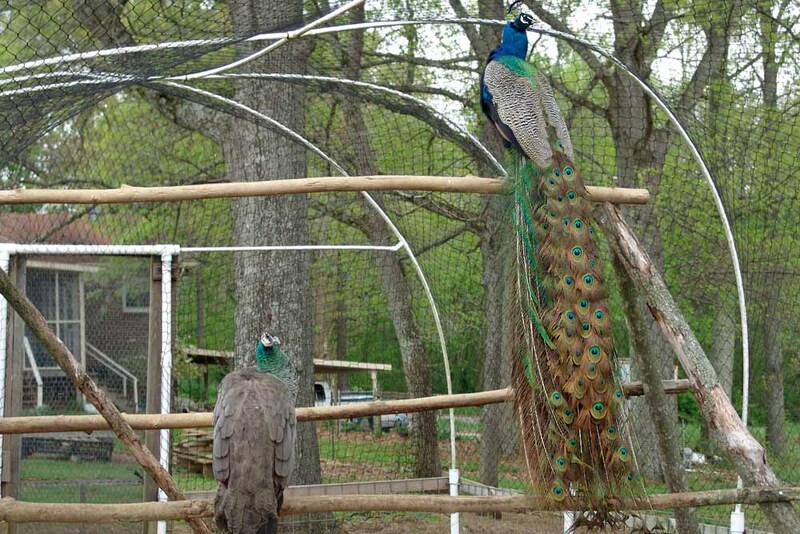 That made it tough when one would escape, as they’d generally fly up in a tall tree. 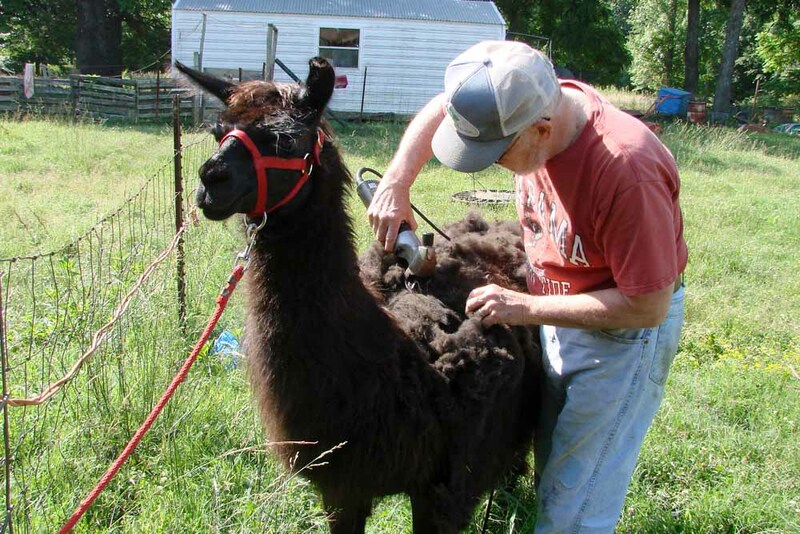 Every spring we have to shear sheep and llamas. Most of the time we hire someone to do it, but as you can see, The Farmer did the deed in 2009. Fortunately, Keira stays pretty still when being sheared and doesn’t kick up a fuss. 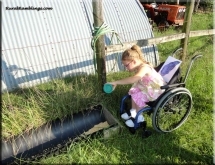 Here’s one of my all-time favorite farm pics! 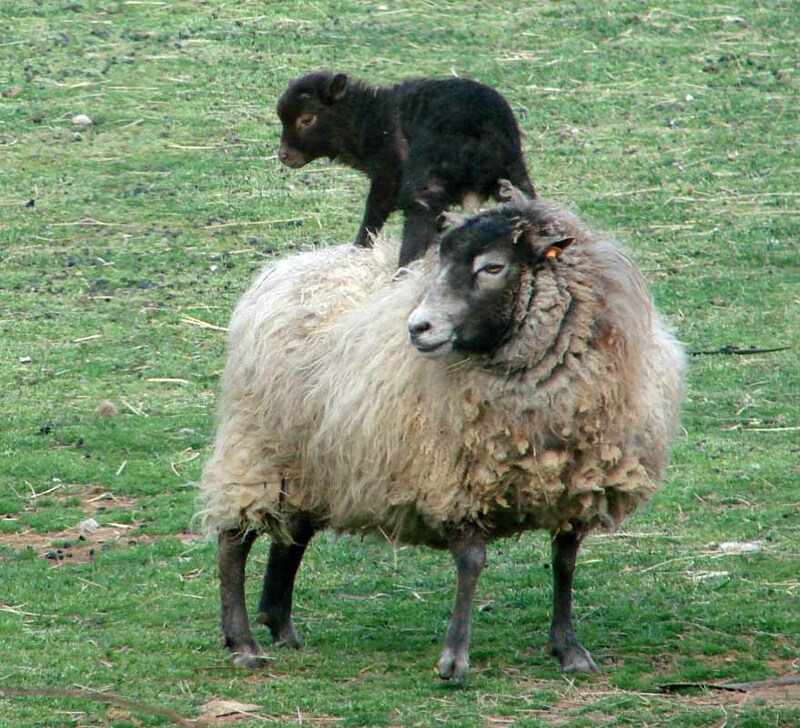 The lambs loved to climb all over their parents as they rested, but this little one managed to hang on when Mama Sheep stood up. Okay, too many pics to go still…. 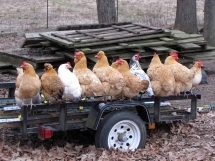 time for a slide show! 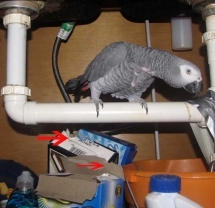 2009: Our parrot hiding under the kitchen sink. 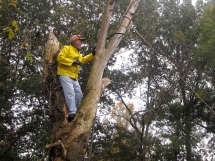 2009: The Farmer playing lumberjack. 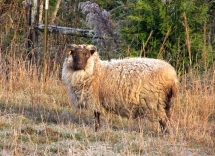 2009: One of my favorite Shetland ewes, Valrhona. 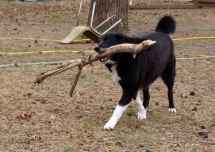 2010: Toby always like to carry a big stick! 2010: Typical guineas nest with 2 hens laying and accumulating LOTS of eggs. 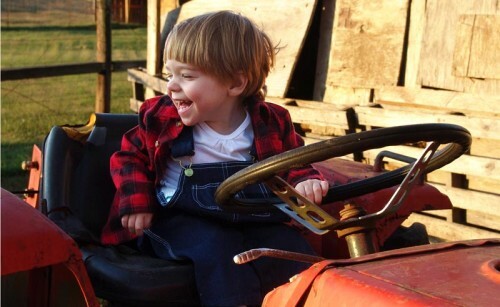 2010: The Farmer on his tractor. 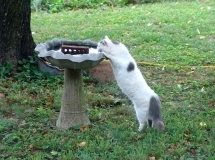 2010: Spot the cat drinking from the birdbath. 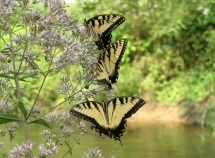 2010: Butterflies on Joe Pye Weed near pond. 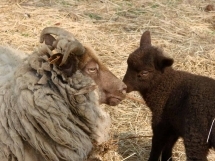 2010: Shetland ewe and lamb. I love the chocolate color! 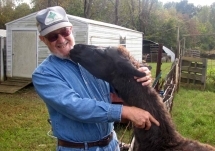 2011: A man and his dog! 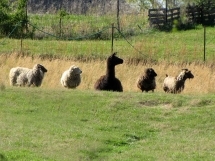 2011: ewe, ewe, llama, ewe, goat. 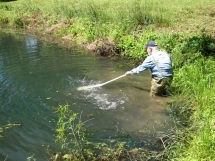 . .
2012: Cleaning out the pond. 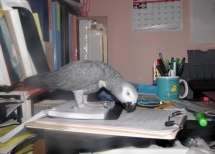 2013: Looks like my parrot is trying to read! 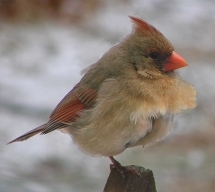 2013: Female cardinal on a blustery day. 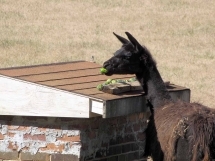 2013: The bane of our farm - FOXES! 2013: My favorite visiting helper. 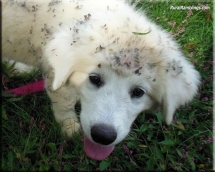 2013: The Farmer walking our new Maremma Sheepdog pup, Tasha. 2013: Dynamic duo of Toby and Tasha. 2013: Exuberant pup running through weeds. 2014: Ellie and her sidekick, Olaf. 2015: Tasha with her pet cat, Sheldon. 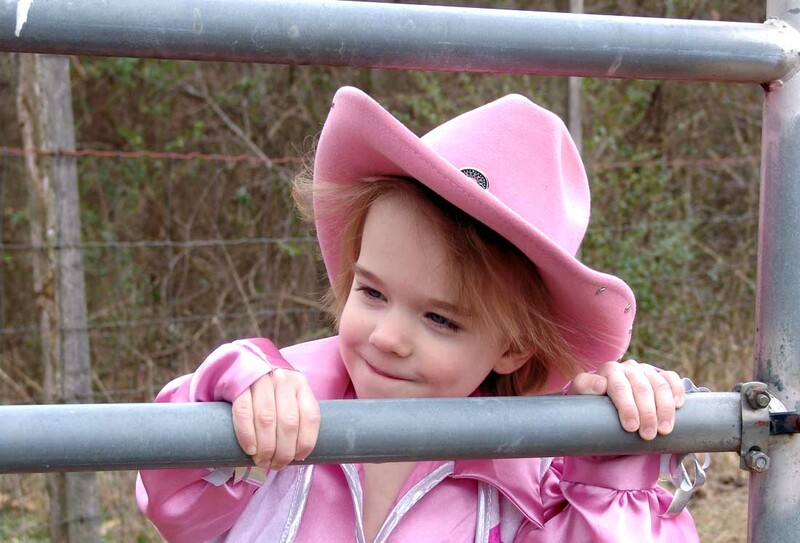 And there you have it, a smattering of photos from the last 9 years of this blog!